I thought I would start sharing some of my skin care routines and products I use on myself. Lately, I've been trying different products on my skin and also looking into natural products that are good for the skin too. My skin has always been up and down, but I feel like I am at an age now where I need to take extra care of it and stick to something that works. I actually prefer using organic products but sometimes it's not that easy, especially with so many products on the market tempting you, it's a nightmare trying to find the right one for you. I wanted to start off by telling you about this place called Roots & Bulbs. I came across it after Victoria Beckham posted an Instagram photo of her pure skin juice and quoting "so good for your skin". Straight away I had to look into this juice and find out where I can get one. 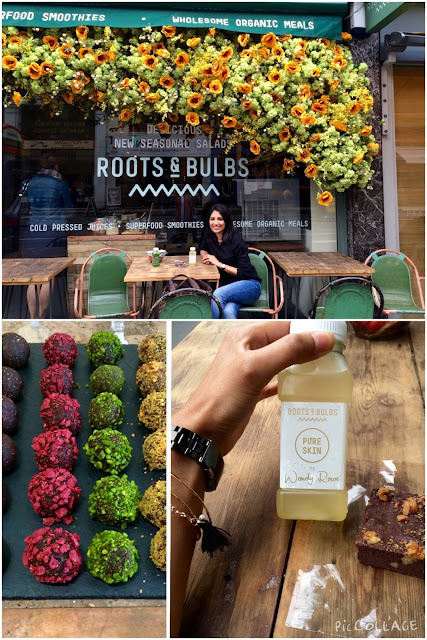 After looking into the whereabouts of Roots & Bulbs, I decided to set off to the Marylebone store with a mate for a girly catch up and juice. It's basically a place to grab food or drink on the go, but the products they sell consists of true organic ingredients. They do cold pressed juices, smoothies and food. Now for those of you that know me, I am not a veggie kinda girl, and when I saw the menu it didn't look like it would satisfy me as I do like my meat and have a sweet tooth at times. But I ordered the pure skin juice by Wendy Rowe and the Gluten free chocolate and walnut brownie as they had nothing else sweeter, although the fireballs (pictured above) looked good too. However I was pleasantly surprised, both were very nice and the pure skin juice was actually really nice. The pure skin juice contained coco water, mint, lemon, cayenne pepper, turmeric, aloe vera and alfalfa. My friend ordered the Greens juice G0 which contained cucumber, kale, spinach, mint, lemon and sea salt, which was also tasty. I suppose if you're like me and wouldn't usually eat your greens, it's nice to get a juice that contains the good stuff and consume it in a drink. I would definitely recommend this place and will probably try the smoothies next time with their brunch. If you fancy making the juices yourself, they do a book that shows the recipes of the juices. Yes it is expensive :( but making them yourself is fun, I need to try one day. So many nice places out there, just need to find them.